As I was preparing to take a look under the hood of this weather station, the Davis Instruments 6163 Wireless Weather Station, I was really pondering some key points. Point 1 would be, is a weather station worth that much more than another weather station? Is the value increase real or is it a perceived value difference to the new owner. Why would I pay over $1000 for a weather station compared to let’s just say a weather station costing you $139.95 currently on Amazon? Point 2 If the value does increase is it worth all the extra expense, the real expense that it is going to cost you. Point 3 So If the value is that much more for you then will you make the investment in yourself to obtain that markedly obvious added value. Will you make the investment to the professional type of weather station you didn’t know you wanted but now after reading our detailed report on all that is there at your fingertips, then the investment will be very worthwhile for you to make. So now let’s take a serious look at the display console that is used. This alone would be enough to convince me of the 6163’s real value. Then further along after we look at the console, many other areas are discussed and you can see for yourself just how professional this weather station unit is. The model 6163 has a very interesting display console that is used by it, to present the weather data that its remote sensors are continuously gathering. Here are a couple of photos to help you understand better, what is presented and how the information is presented to you as well. The following types of data are collected and displayed on the console for you, some are available on recall for you. Current Display Data . . . . . . . . . Current display data describes the current reading for each weather variable. In most cases, the variable lists the most recently updated reading or calculation. The console also displays icons, to show what your current weather outside is. These icons are as follows. Weather forecast icons used arethe sun, partly cloudy, clouds, rain, or snow. The display will also take you through 8 Moon phases each lunar cycle. Other features that can be viewed on the Davis display console are any of the following highlights. Some may intrigue you, others may not. But they all are possibilities for you, and are provided by your Davis Instruments 6163 Wireless Weather Station. So moving along to some need to know things about the Davis Instruments 6163 Wireless Weather Station. The Integrated Sensor Suite(ISS) includes the following, instrument sensors that will measure the weather for you. The software that is provided by Davis Instruments as add-ons are listed below for you. These are all accessory software packages that may be purchased. They too are listed below with some tips about the programs included below the list. Also please go to our review on the Davis Instruments 6250 Vantage Vue Wireless Weather Station which may be FOUND HERE to read in more detail our section on these data logger software additions. Yes, the software may be purchased and used with the Davis 6163. The constantly updated readouts will provide you with current weather conditions from your station’s remote sensor readings. Davis makes available for separate purchase 8 different software products. Some of these are smaller features for sections of the sensor program but some are entire software packages for the entire weather station. Please realize that your weather data as it is accumulated is automatically saved to Davis’s web servers. This actually provides four times the storage that the data logger does. If you wish to become part of the WeatherLink Network, then you can use the WeatherLinkIP data logger. The WeatherLink Network is a collection of websites containing customer weather information that is stored on a server owned by Davis Instruments. Here is some exciting news to tell you. Being part of the WeatherLink Network and having a site on WeatherLink.com means you are part of a community of weather enthusiasts who use the WeatherLink Network to view their own weather data. All who are a part of this network share that weather data with friends and people across the world quickly and easily. This can bring a great deal of enjoyment and satisfaction to your hobby and work. ❌ Many features may be obtained only by purchasing extra programs. They are not included in your original purchase. ❌ The anemometer cups are plastic. Some believe this can be a problem in how accurate the wind speed is recorded. After much study and reading, I have decided this weather station should be rated as a 4.5 Star rating. In doing so I decided on this being a great entry point for someone who wants to jump up to the level off professional equipment. Yes, I have decided the real value I talked about at the beginning of this article is indeed real value, not just perceived value. With that in mind, I really think that there is a really great value in owning this weather station. In spending or as I would like to think (investing) in this weather equipment, I am setting myself up for the best weather experience, I have ever personally had. I am not a trained meteorologist but I get to be like a real meteorologist using this wonderfully built weather equipment. So if you are a big fan of weather, or as I say George Loves Weather (I Really Do) so please take a serious look at the Davis Instruments 6163 Wireless Weather Station. 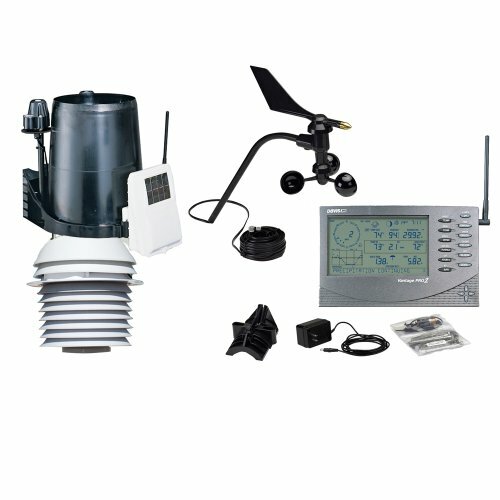 The Davis Instruments 6250 Vantage Vue is a professional level personal weather station. It is reviewed here in great detail. This is my complete Vantage Pro 2 (model 6163) weather station with all the possible additional units added on. It features a 24 hour fan aspirated radiations shield, solar and UV sensors, a heated rain collector to melt snow and ice, a complete soil moisture, temperature and leaf wetness station with additional modules, one secondary temperature station and a remote anemometer kit. The station was installed in September 2011, and moved in March 2012 to its current position. The video was shot in July 2013. The Davis Instruments 6163 Wireless Weather Station is about as close that you will get to having a professional weather station without paying the price for a professional weather station. The equipment is near pro quality and the price is not. Both are wins for you.